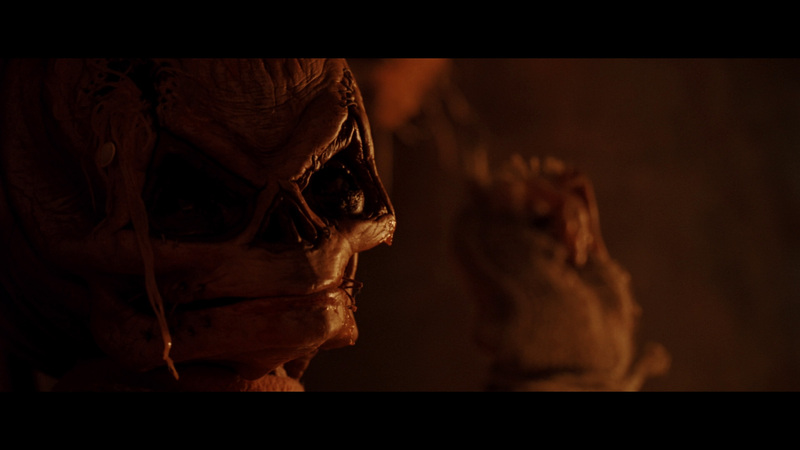 There was a time not all that long ago where horror anthologies were a pretty regular theatrical occurrence, but it’s seemed as of late that those days were long behind us – enter first time director Michael Dougherty and his debut feature, Trick ‘R Treat, an anthology film set on Halloween night in a small Ohio town. 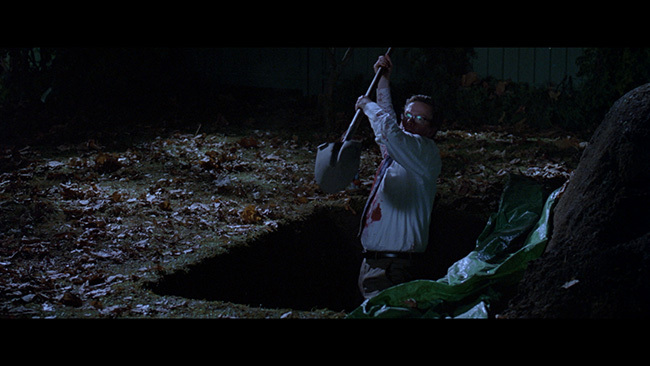 Owing much to films like Creepshow and television shows like Tales From The Crypt and Tales From The Darkside, the film feels very much like a throwback to old fashioned horror, though made with all the glass and style you’d expect from a newer feature. 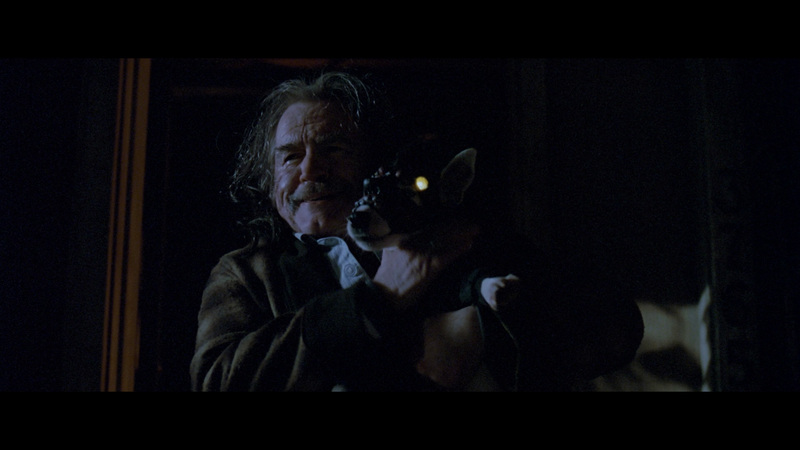 The film mixes in six different stories all of which interconnect based on location and characters. The first tells of a couple who come home to clean up the front yard after a night of drinking, only for the wife (Leslie Bibb) to meet with a very unfortunate end while her husband (Tahmoh Penikett) passes out watching dirty movies upstairs. This leads into a bit where the school principal (Dylan Baker) gets revenge against one of the local kids much to his own son’s amusement, which segues nicely into a bit about a group of four young ladies heading out for a night of partying and boy-boffing. Despite the initial hesitance of the virgin of the group (Anna Paquin) the group insists on attending a lively party but with surprisingly shocking results. From there we see a group of pre-teens play a nasty prank on ‘Rhonda The Retard’ by taking the poor girl down to an abandoned quarry where, local folklore has it, a bus driver killed a bus full of special-ed kids by driving the bus into the water below. 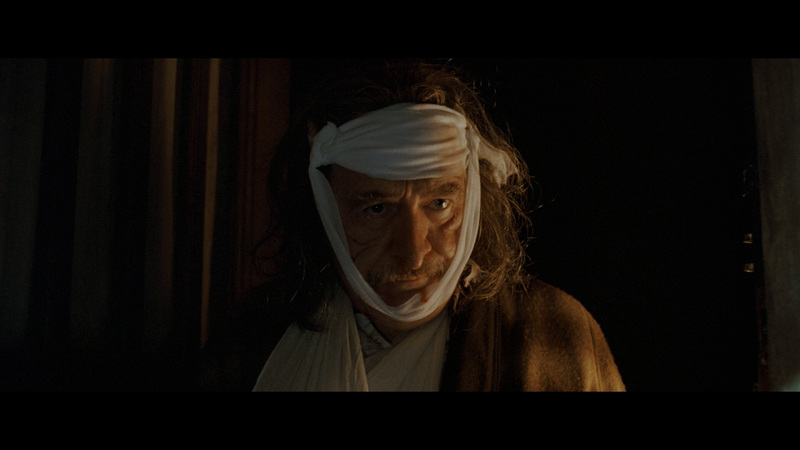 Of course, these things never go as planned, which leads into our last story, where the principal’s crotchety old neighbor (Brian Cox) gets a surprise visit from an unexpected and nasty guest. Benefiting from a decent cast and an interesting (and often times amusing) oddball structure, Trick ‘R Treat is a whole lot of fun, the kind you don’t seem to get in horror movies these days. It never feels intentionally retro or kitschy, at least never intentionally so, but it definitely feels like a product of the eighties and I mean that in the best possible way. The performances are fine across the board, with the always charming Paquin delivering a wholly believable performance as ‘the innocent girl’ (and looking fine in her Little Red Riding Hood outfit) while Brian Cox plays the mean Mister Wilson type perfectly. 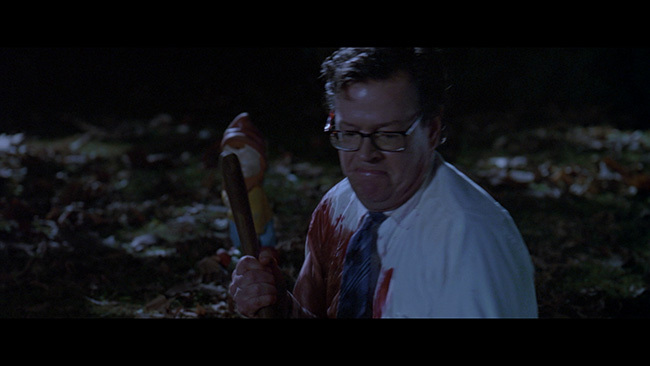 Bibb and Penkiett are pretty disposable, literally when speaking of their characters, but Dylan Baker is great as the twisted school principal who harbors some very deep-rooted issues. 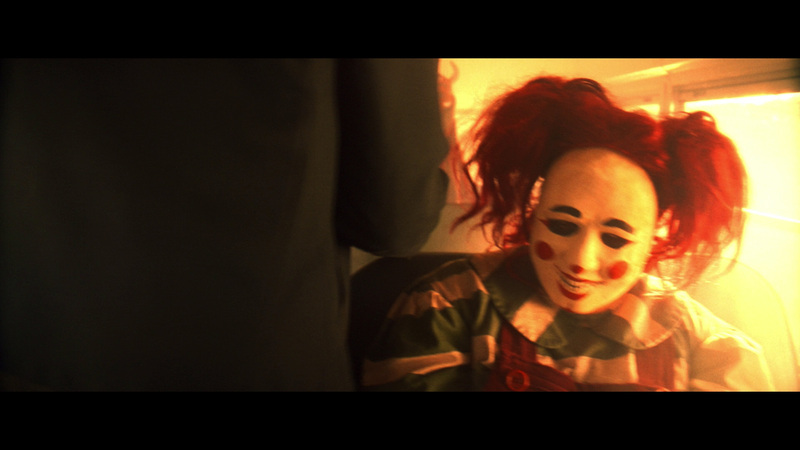 At just over eighty minutes the movie kicks along nice and quickly, never overstaying its welcome and managing to deliver some great make up and gore effects along the way. There are a few well timed jump scares to keep you on your toes as well as a nice, thick atmosphere of general weirdness that fits in perfectly with the various costumes and characters running throughout the movie. 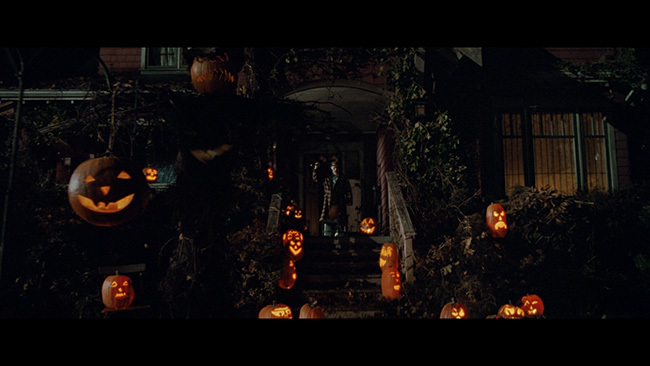 Despite its straight to video origins, Trick ‘R Treat proved to be considerably better than most of the horror films that managed to find theatrical play in 2009 and it’s nice to see that it has found the audience it deserves on home video since then. 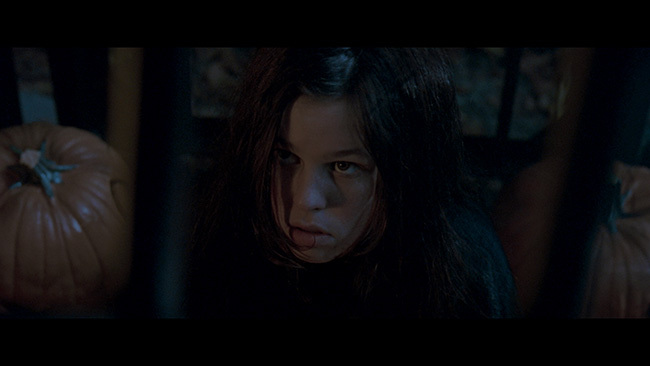 The AVC encoded 1080p high definition transfer, framed at 2.35.1, on this Blu-ray reissue from Shout1 Factory is taken from a ‘new 2K scan of the original film elements supervised and approved by director Michael Dougherty.’ The color timing is noticeably different here, with whites having a slight pink tint to them in some scenes but compression is solid and the image doesn’t have any DNR or edge enhancement issues. That pink push to the color timing does have an effect on skin tones, however. Back levels are decent and there’s really nice fine detail and depth to the image. Audio chores are handled by an English language DTS-HD 5.1 Master Audio track in the film’s native English. Optional subtitles are provided in English only. There’s good surround activity here. 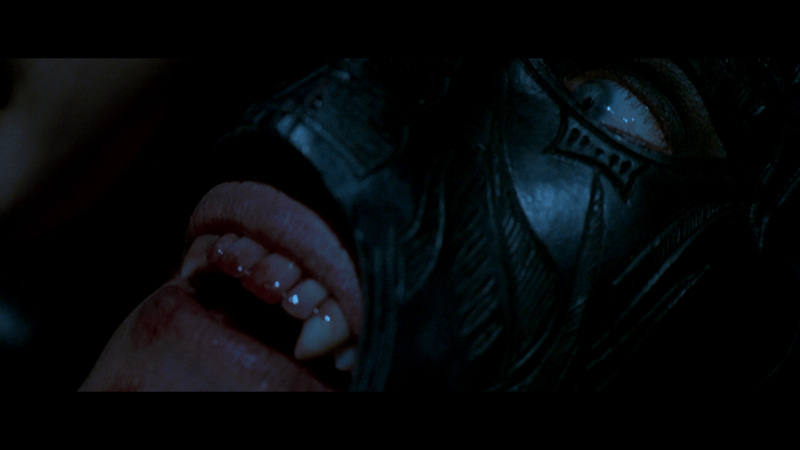 The dialogue is mainly upfront with the rears used for the score and for effects, but it works. The track is nicely balanced with no hiss or distortion to note. 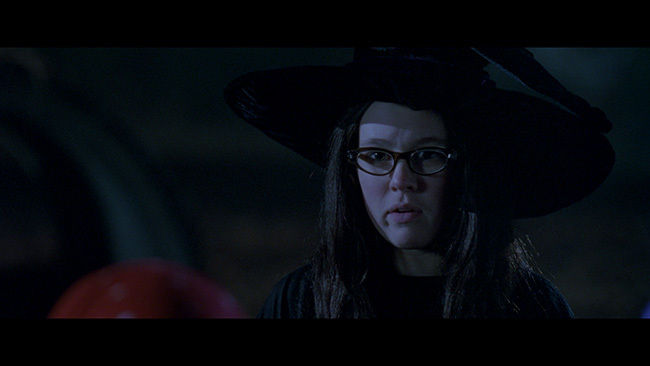 The extras start off with a commentary track, taken from the original Warner Blu-ray release, where writer/director Michael Dougherty is joined by artists Breehn Burns and Simeon Wilkins and composer Douglas Pipes for a fairly in-depth talk about putting this project together. Understandably Dougherty is the point man here, and he’s got the most to say and he does a good job explaining the projects origins and the trials and tribulations he went through to get it finished. The other participants all chime in to elaborate on points when and where they can and there’s a nice, relaxed, and sometimes rather funny atmosphere here that makes it a pretty easy track to listen to despite a few too many instances of dead air. From there, we move into a host of new featurettes created exclusively for this release starting with Tales Of Folklore & Fright: Creating Trick ‘r Treat which is a sixteen-minute piece made up of interviews with writer/director Michael Dougherty, conceptual artist Breehn Burns, and storyboard artist Simeon Wilkins. They cover the origin of the project and share some interesting stories from their work together on the film. The focus here is on the pre-production process and what went into putting the story together as well as discussion of some of the influences that worked their way into the movie. In Tales Of Mischief & Mayhem: Filming Trick ‘r Treat we sit down with Dougherty for twenty-minutes to hear him talk about the film’s unique visual style, why certain casting choices were made the way they were, how locations for the film were chosen and more. 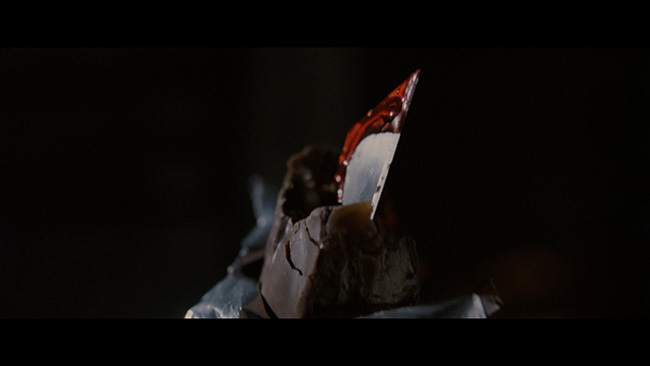 The Sounds Of Shock & Superstition: Scoring Trick ‘r Treat interviews Dougherty and composer Douglas Pipes for eleven-minutes and, as you’d have probably guessed having read this far, the focus of this piece is on the music used in the picture. Dougherty chimes in throughout but it’s Pipes’ comments that have more weight this time around as he talks about what he tried to bring to the movie with his compositions and what went into creating them. 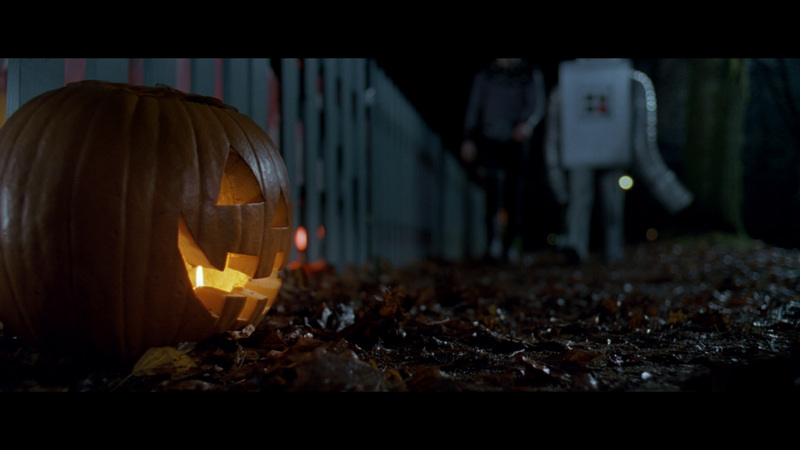 Tales Of Dread & Despair: Releasing Trick ‘r Treat is an exploration of the film’s release and the fandom that quickly grew around it. Both Michael Dougherty and writer Rob Galluzzo (of the Shock Waves podcast) are interviewed in this seven-minute piece and it’s quite interesting as the cult that grew around this film didn’t have decades to develop the way that other cult films have over the years. Shout! Factory also includes Dougherty’s shot film Season’s Greetings, presented from a new 2K scan of the original 16mm elements with optional commentary by Dougherty. This four-minute animated short is quite cool to see, it’s definitely got a lot of the same Halloween spirit that Trick ‘R Treat does and it’s our first introduction to the Sam character. Shout! Factory has also included Monster Mash, a thirty-four-page comic book story from the Trick ‘R Treat graphic novel – this is very cool and worth checking out. In the FEARnet.com Shorts section we get thirteen-minutes of material originally conceived for the late, lamented VOD horror channel. Here there are fifteen little promo spots in total, the bulk of which promote Halloween (though a few promote other holidays as well). They’re fun and it’s great to see them here. Also worth checking out is the twenty-eight minute featurette, The Lore And Legends Of Halloween, again found on the old Blu-ray and which is structured in such a way that it intertwines factual information about traditions of the holiday with some cool making of footage and cast and crew interview bits. It’s a different way of presenting the standard behind the scenes documentary and it works quite well. 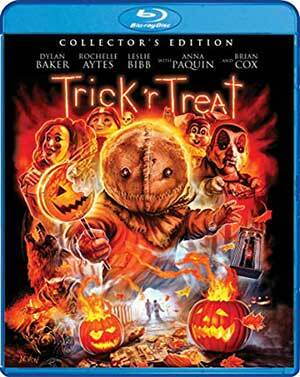 This new release also carries over the seventeen-minutes’ worth of deleted material (basically just some character extensions which don’t add a whole lot and which would have hurt the pacing of the picture) complete with optional commentary from Dougherty, a neat Trick ‘R Treat animated short (also with optional commentary) and a quick one minute bit that shows how CGI was used to create the school bus scene from the film. A trailer for the feature, a behind the scenes still gallery, a storyboard and concept art gallery, menus and chapter selection finish off the package. This release also comes with some nice reversible cover art and, for the first pressing, a collectible slipcover. 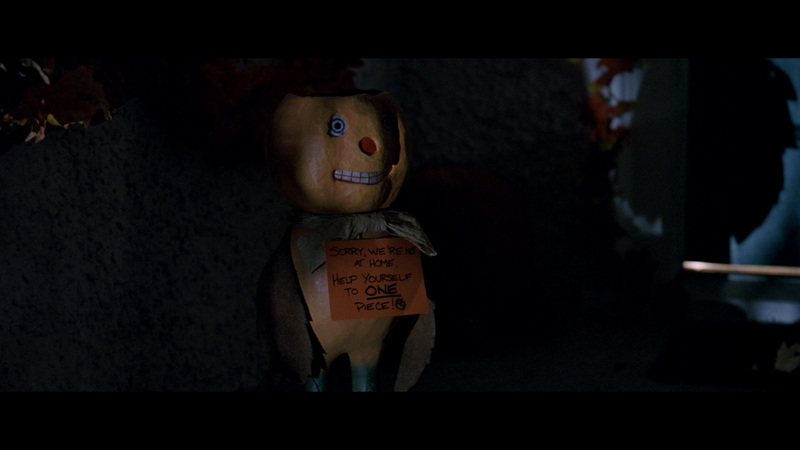 Twisted, funny, classy and scary all at the same time, Trick ‘R Treat gets a nice Blu-ray upgrade from Shout! Factory with an improved transfer and an impressive array of supplements old and new to complement one of the best major studio horror films of the 2000s. 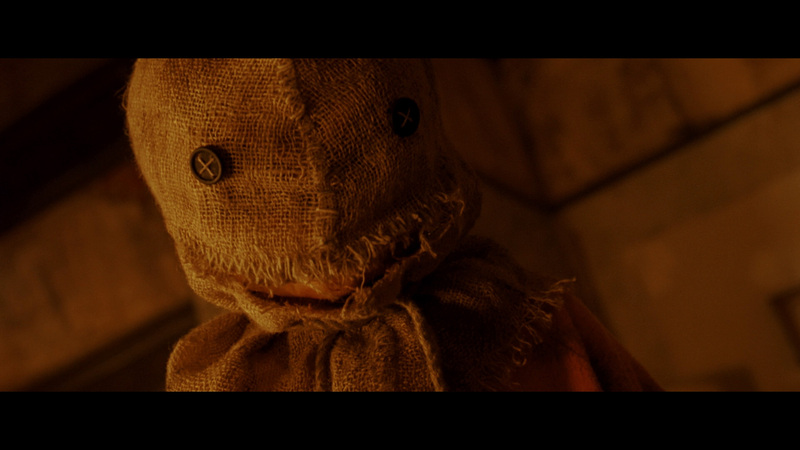 Click on the images below for full sized Trick ‘r Treat Blu-ray screen caps!